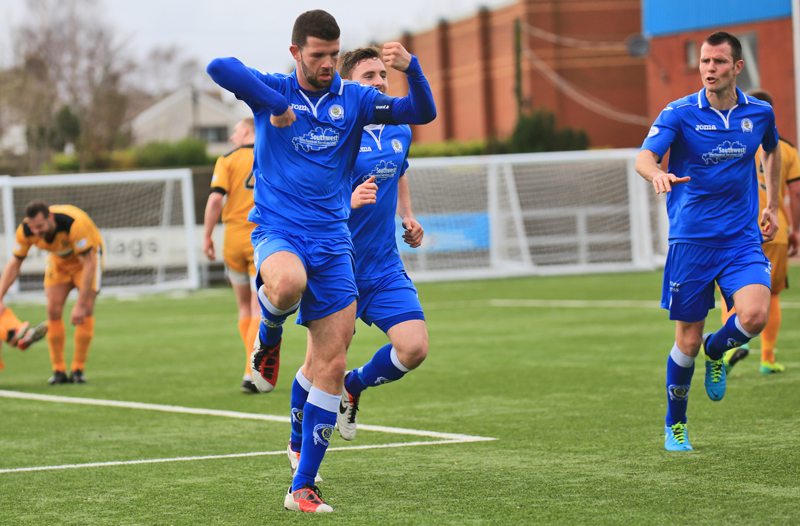 An almost faultless first- half performance from Queens was the key to them returning to winning ways as a 3-1 victory over Dumbarton saw them become the first team to beat Ian Murray`s side this calendar year. 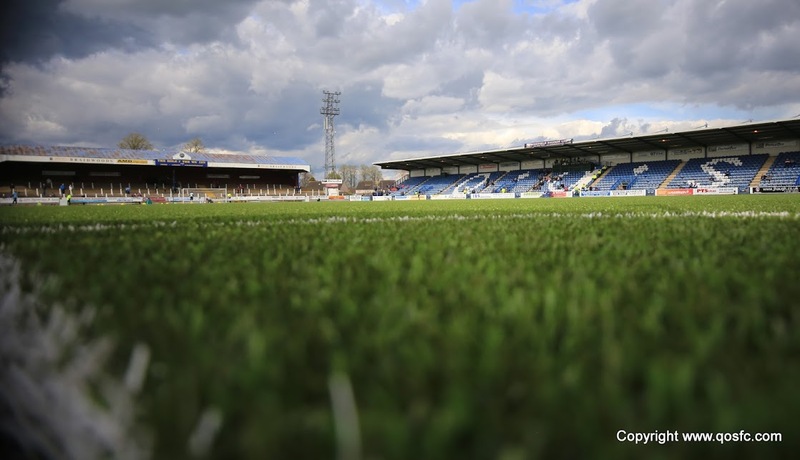 After suffering consecutive single goal defeats to Dundee, and Falkirk, Queens recovered well from the disappointment of those results, and were good value for the win that lifted them above their play-off chasing rivals and into fourth place in the league table. With Michael Paton out injured, Queens were forced into making at least one change to the side that so nearly claimed a point at the Falkirk Stadium, and boss Jim McIntyre opted to make one further switch as Gavin Reilly replaced Derek Lyle upfront. The unfortunate injury to Paton led to leading scorer Iain Russell starting for the first time since the draw at Morton. Visitors Dumbarton arrived in Dumfries with the best current form in the league, with 4 wins and 3 draws from their last seven league games,and added to that, a cup win over Alloa made them unbeaten in 8 games, a sequence of results that had seen them remain unbeaten in 2014. Having scored in every game during the unbeaten run, the `Sons` began the day as the league`s leading scorers with 45 goals to their credit, although at the other end, their 45 goals against meant that only Cowdenbeath had conceded more. With Dumbarton winning at Palmerston back in September, and Queens gaining the win at Dumbarton in December, and with the teams currently separated by just a single point, it seemed as though an even contest was on the cards. Queens began in a 4-4-2 line up,with Mark Kerr, and Ian McShane playing in central midfield, and the early signs were good as both players started confidently, passing the ball around with pace and accuracy, and there was an early appeal for a Queens penalty after Gavin Reilly seized on McShane`s through ball inside the box, but referee McLean waved away the appeals which were in fairness, coming more from the fans than from any of the Queens players. It was the home side who continued to have the better of the exchanges, and Paul Burns went very close to putting Queens ahead on 8 minutes after Andy Dowie`s long free kick fell nicely into his path, however his speculative half volley from just outside the penalty area clipped the top of the crossbar. The visitors seemed willing enough to sit back and hit Queens on the break, and on a couple of occasions in the opening 15 minutes, they did win themselves two corners, the second of which gave centre-back McLaughlin a half chance, but from close range he was only able to hoist the ball over the bar. The midfield battle at this stage of the game was clearly being controlled by Kerr and McShane, and the pair exchanged passes as McShane found Reilly on the right, and although the cross was blocked, it was yet another promising move started in central midfield. Moments later after winning possession on the right, a fine cross from Chris Mitchell found the head of Bob McHugh, but off balance, the striker could only head wide of the target. With both McShane and Kerr involved in most of Queens attacking play, it was no surprise that they were involved again minutes later linking well to send Paul Burns racing in on goal, with the hosts only being denied the opening goal by a fine finger tipped save by `keeper Ewings. It was pretty much one way traffic at that point, and Iain Russell was next to go close for Queens, his fine effort from the edge of the box almost breaking the deadlock. For all their dominance, Queens would have been a little concerned that they still had not managed to get themselves in front, however after half an hour, all that changed as they found the opener from a set-piece. After a Dumbarton attack was broken up, the ball fell to Reilly just outside his own penalty area, and the youngster was able to pick out a neat that pass found Russell breaking clear on the left. Queens leading scorer tried to pass the covering defender but it did look as though he was pulled back and a free-kick was given by referee McLean. Chris Mitchell took the free-kick and his perfectly flighted cross was met by captain for the day, Mark Durnan, who guided his header past the `keeper to give Queens a well deserved lead. 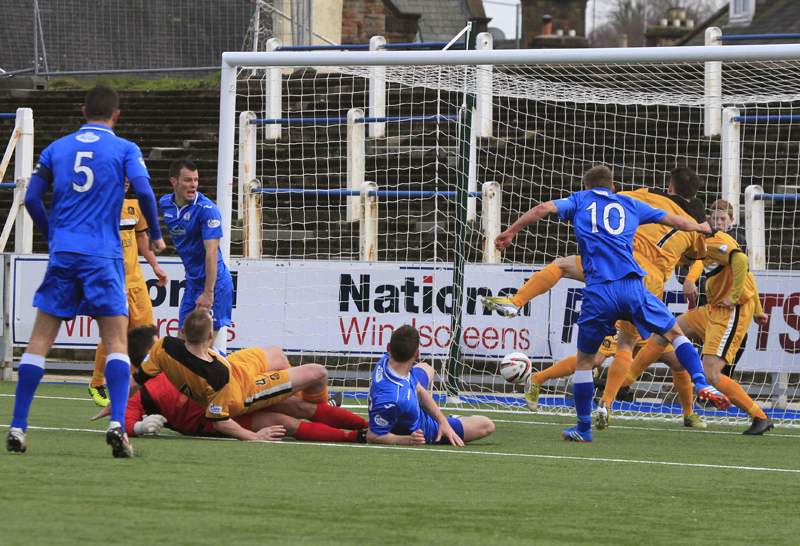 The opening goal was no more than Queens deserved, but with the visitors having found the net in all of their previous 8 games, it did seem as though Queens would have to score again to take the points, and just minutes falling behind, Dumbarton had a really good chance of getting back into the match. Mark Durnan was penalised for a foul right on the `d` of the penalty area, but the chance was wasted when Agnew`s rather weak effort went straight into the Queens defensive wall. Just before the interval, Queens might have added a second goal when Mark Kerr`s lofted ball into the box fell at the feet of Russell, but under pressure from two defenders the striker was only able to lob the ball over `keeper and crossbar. Another chance presented itself moments later after a superb ball from Burns set up a chance for Reilly, and only the right hand of Ewings prevented his side from falling further behind as he diverted the ball away for a corner. However, just as it seemed as though Queens would have to settle for a single goal lead at the break, they took full advantage from the set-piece to go further ahead. Mitchell was once again very accurate with his delivery, and although it looked as though McHugh might open his Queens account from close range, the striker missed the ball with his head, but fortunately for Queens the ball ran through to Gavin Reilly who thumped it home at the back post. There was only just time for the visitors to re-start the game before the referee brought to an end a very satisfying first half for Queens as they left the field well worth their two goal lead. Both sides began the second period unchanged, and as expected, Dumbarton looked like a different team., and they showed more attacking intentions in the opening minutes of the second period than they had done previously. Striker Kane somehow managed to get past 3 Queens defenders down the right wing before his cross was blocked away by Dowie, and as they continued to take the game to Queens, experienced striker Nish should have done better than he did when shooting wide from a good position. The visitors won the first corner of the half, which Queens defended well and turned into a counter attack that ended with a shot from McHugh being blocked away by `keeper Ewings. The majority of the attacking was still being done by the visitors, and on 53 minutes Kane went very close to pulling a goal back after knocking the ball beyond Zander Clark, but fortunately the Queens `keeper was able to scramble the ball to safety. Queens were happy to rely on the pace of Reilly on the break, and the youngster linked well with Russell before delivering a right wing cross into the box, but a mix up between Kevin Holt and Paul Burns saw them tangle with each other and the chance had gone. Mark Kerr appeared to take a slight knock early in the half, and he was replaced by Danny Carmichael after 63 minutes., and just 3 minutes later, Queens scored again. Ian McShane slipped the ball into the path of Bob McHugh, and after initially failing to gather he got the break of the ball to drill home a fabulous strike from just inside the box to open his scoring account for Queens. Visiting boss, Ian Murray, responded by making a triple substitution, and within minutes of doing so, two of them combined to pull a goal back. Steven McDougall did well on the right and pulled the ball back to fellow sub, Michael Miller, and the on-loan Celtic youngster hit a cracking shot that went in off the far post. 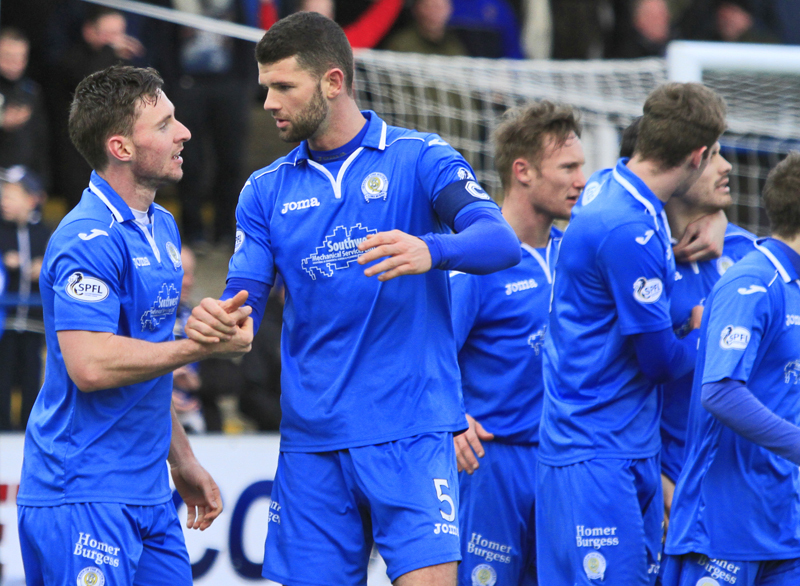 Queens made a second change after 72 minutes when Derek Lyle replaced Gavin Reilly, and as Queens broke away down the left once again, Russell went down under the challenge of McGinn only to see referee McLean produce a yellow card for simulation for the Queens striker. Dumbarton substitute Miller looked lively, and more good play from him created a chance for Agnew, but his shot across goal evaded everyone. At the other end another swift break by Queens almost led to a fourth goal when McHugh got free down the right, but in attempting to find a pass into the area he elected to seek out Russell, when perhaps the better ball would have been to the unmarked Lyle. To their credit, Dumbarton continued to press forward and they had a chance to make it a nervy final few minutes for the home fans in the crowd of 1604, but Queens `keeper Clark saved well at the feet of Kane with the `keeper`s momentum taking him into team-mate Mark Durnan who needed some attention before continuing. Queens made their final change of the game when Iain Russell was replaced by Derek Young, and as the game drifted through to it`s conclusion, Queens were able to see out the game with no further worries. Sponsors named Mark Durnan as their man-of-the-match as Queens became the first team to record a win against Dumbarton this year. 17 min Nice link-up play in the middle of the park involving McShane and Kerr but Queens fail to break through in the final third. 20 min Brilliant save from Ewings denies Paul Burns the opener and Russell and McHugh fail to put in the follow-up. 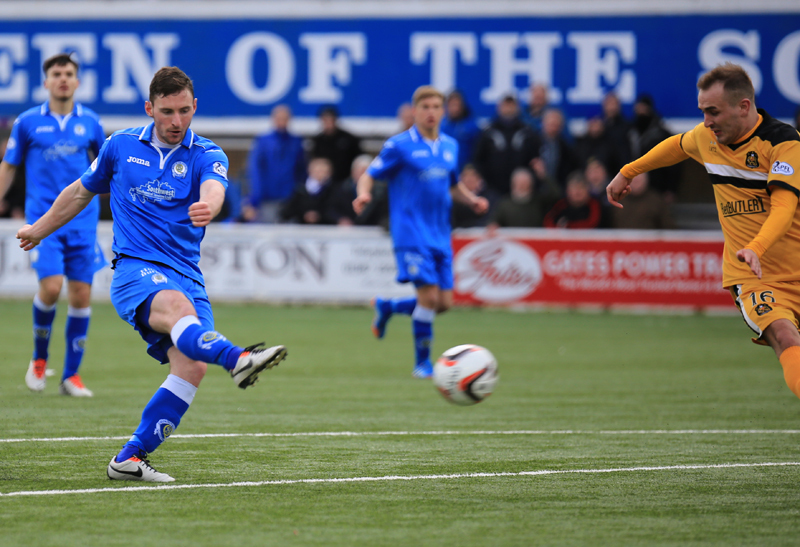 27 min Iain Russell watches his 30 yard effort narrowly sail over the bar as Queens continue to push for the opener. 30 min Mark Durnan heads the ball in from a free kick just outside the box and Queens go 1 up! 44 min The ball falls to Iain Russell six yards out but the pressure from the defenders causes him to scoop the ball over the bar. 45+1 min Another top save from Ewings in the Dumbarton goal stops Reilly from adding the second. 45+2 min Reilly gets his chance from the resulting corner and makes no mistake this time! Half Time A good first half from Queens and they go in at half time with a deserved two goal lead. 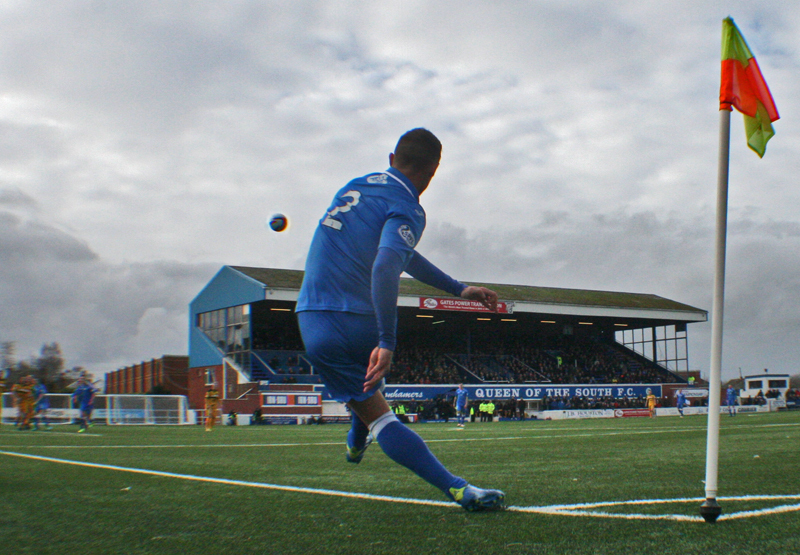 Half Time Today`s attendance at Palmerston is 1604. Half Time The teams are back out on to the pitch and we are ready to start the second half. 48 min Nish drills the ball past Zander Clark but wide of the mark as Livingston look to find a way back in to the match. 52 min Zander Clark scrambles the ball off the line as Kane of Dumbarton knocks the ball by him. 61 min Dumbarton are pushing hard to get back in to the match with Durnan and Dowie being called in to action. 66 min Bob McHugh opens his account for Queens with a fantastic strike from the edge of the box. 67 min Dumbarton go up the other end and Queens get a huge let-off following a miss from Agnew. 79 min Dumbarton come close again as Agnew drags his shot wide. 10 minutes to go here. 80 min Lyle fails to play in Russell for an easy tap-in. 86 min Great save by Clark denies Kane. 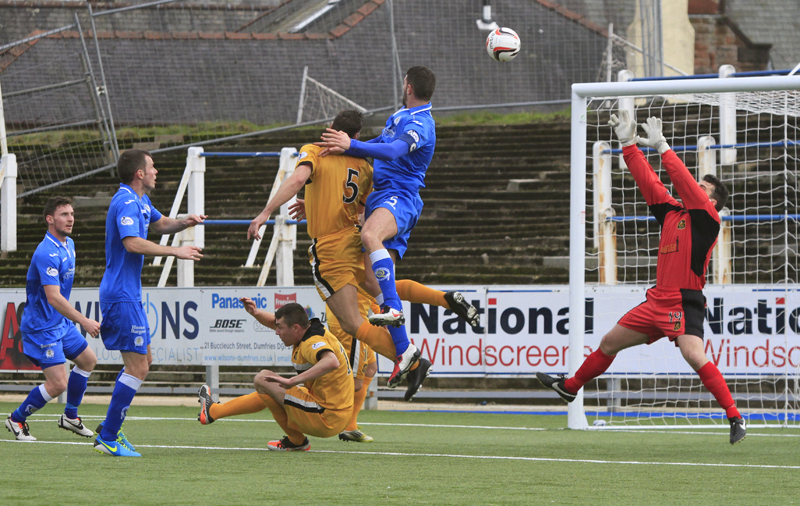 5 minutes to go at Palmerston. 90+2 min Today`s Man of the Match is Mark Durnan. 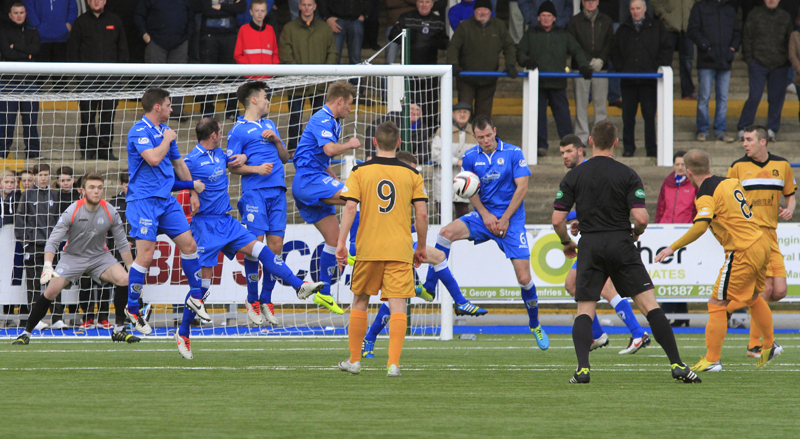 16:51 Queens now leapfrog Dumbarton in to the fourth and final play-off spot. Match report and reaction to follow.